Upmarket vintage and second-hand clothes and accessory shops. Despite being pretty hilly, Tokyo has a lot of cyclists, including parents loaded up with kids front and back, plus shopping. These bikes are robust, heavy and the child seats look really sturdy and weatherproof. Some of the bikes also have electric motors – used, for example, to pull away more easily at traffic lights and for those hills. The crime rate is really low and petty vandalism rare. Bikes were often parked with simple wheel locks and not secured to anything. But if you want to look after your bike more securely, there is this multi-storey underground storage system where you load in your bike, and when you want it back you type in the code and the system delivers it. It’s hard to eat fully vegetarian in mainstream cafes and restaurants, because of the ubiquitous dashi (fish broth) and dried grated tuna flakes (bonito) which garnish a lot of dishes. But we tracked down some fabulous vegetarian and even vegan places in Tokyo. And our hosts in Kyoto and Osaka also arranged meals in places which could cater for us. Cafe Stay Happy, Tokyo – cosy relaxed café with organic, vegetarian and vegan options. Moku-Moku, an all-you-can-eat buffet with plenty of vegetarian options. Osaka station. Matsucho, Kyoto. A traditional Kyoto restaurant which did us a wonderful bespoke veggie meal. We saw organic sections in supermarkets too, as well as all sorts of tofu and soy products. And a restaurant called Luke's Lobster promised traceable seafood. But almost all the fresh produce we saw was overpackaged – single apples in plastic wrap and individually wrapped biscuits and small cakes inside bigger plastic bags. We were able to get minimally packaged produce at the Sunday Farmers’ Market by the United Nations University, but you would be hard pushed to do your weekly shop this way. We stayed in three holiday lets. All were heated by a mix of electric fan heaters and air con units. It was late February and early March, and although we had some beautiful days it was always cold at night. None of the homes had good insulation. Metal window frames, single glazing and thin walls meant heat was lost quickly. A different approach was apparent in both the heated floor mat in our first holiday home (think of an electric blanket crossed with a sheet of lino on the floor) and the kotatsu heated tables with integrated blankets. You sit around the table which has a small heater under the table top and put the blanket over your legs to keep the heat in. Toasty. We saw acres of solar PV, on roofs and ground-mounted, alongside the bullet train route from Tokyo to Kyoto. And far off in the distance, one onshore wind farm. Solar PV - Japan has 42.75 gigawatts installed, compared to the UK's 11.73. Wind - Japan has 3.28 gigawatts installed, compared to the UK's 15.7. And carbon-related, although not exclusively energy… The label is from a shirt which has been carbon offset. Understandably, it’s the threat of tsunamis which is most apparent in the approach to flood risk management which I could see as a member of the public. 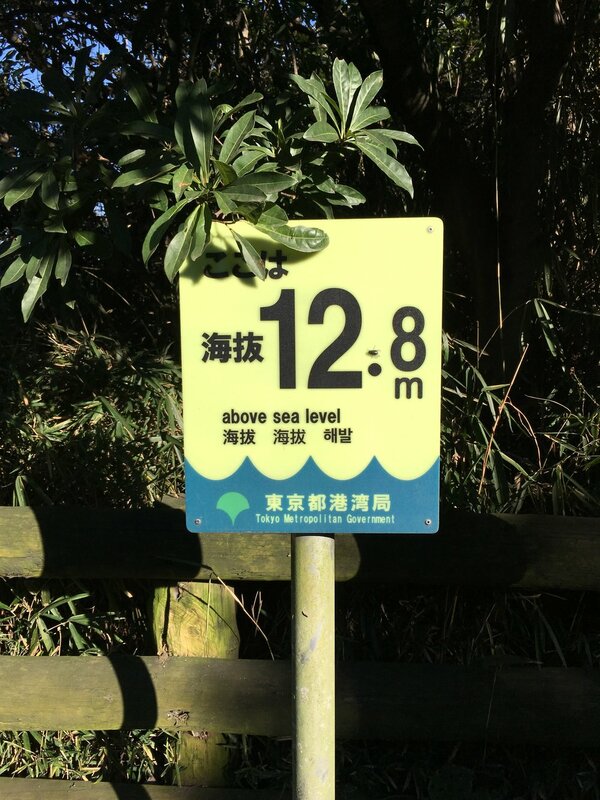 Signs tell you how far above sea level you are, and local maps include the location of emergency shelters and high ground. In Tokyo, despite its hills and the concentrated rainy season, the ground seemed to be heavily paved and waterways engineered and culverted. People have got very good at growing healthy-looking flowers, shrubs and trees in very constrained spaces, but the amount of land where water can seep into the soil was pretty small in the city, as far as I could see. I had heard, via Carolina Karlstrom’s SDG Network Meet up, that an interactive game based on the SDGs had been a big hit in Japan. While I still haven’t seen the game played, I did meet Japanese people who had played it and who know people who have facilitated it. I also saw a lot of posters telling people about the SDGs, in the street and on public transport. I can’t recall ever seeing any equivalent public awareness campaigns in the UK. If you live in Japan, or have visited, I would love to hear more about everyday eco-living - what makes it harder, what makes it easier, what we can learn from each other. Please post in the comments below. This post was first published in my Making the Path by Walking newsletter, March 2019. For practical tips on facilitation, organisational change and sustainability to your inbox each month, scroll down to the footer to subscribe.